Allen (undisclosed) posted four assists and a rebound across four minutes during Friday's 107-102 loss to the Wings. Allen was held out of Wednesday's game due to a medical procedure, though was feeling well enough to take the floor Friday. She was eased back into game action, as she averages 14.9 minutes per game. Allen (undisclosed) did not play Wednesday against the Liberty. Allen was held out of action following an undisclosed medical procedure. Consider her questionable for Friday's matchup with Dallas. Allen, due to a general medical procedure, is questionable for Wednesday's matchup against the Liberty, Andrew Joe Potter of The Score reports. While there's no indication the procedure is serious, it's enough to put Allen's status for Wednesday into question. In the event she's ruled out for the tilt, Tamera Young and Moriah Jefferson could be in line for bigger roles. Allen mustered five points (2-6 FG, 0-1 3Pt, 2-2 FT), six assists, three steals and two rebounds during the Aces' 105-98 loss to the visiting Storm on Sunday. Though she only shot 33.3 percent from the floor, Allen played well Sunday as she finished with a team-high six assists. Claimed off waivers a little less than a month ago, the second-year guard has started all three games for the Aces in 2018 and is averaging 30.7 minutes, 6.3 points, 4.0 assists and 3.7 rebounds. Allen was claimed off waivers by the Aces and played 29 minutes in their season opener, scoring six points and corralling five rebounds. Allen was released by the Liberty just before the start of the season, as the former second-round pick was never able to solidify a role in their rotation. Her services are more than necessary in Las Vegas, however, as Moriah Jefferson continues to recover from a knee injury, and guards Kelsey Plum and Kayle McBride remain overseas. Allen will definitely see her playing time take a hit when the team is at full strength, but should continue to see extra minutes in the short term. Allen was let go by the Liberty on Thursday, HoopFeed.com reports. 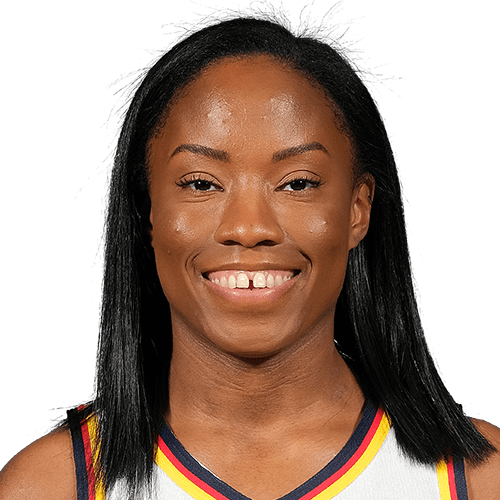 Allen was a second-round pick in the 2017 WNBA Draft and played a small role for New York off the pine, averaging 1.9 points, 2.2 assists and 1.5 rebounds in 13.4 minutes. She apparently couldn't make the improvements necessary to secure a roster spot this time around. Allen played just a minor role for New York during her rookie campaign, averaging a meager 1.9 points, 1.5 rebounds and 2.2 assists across 13.4 minutes. The former second-round pick will likely continue to play a limited role off the bench for the Liberty despite inking an extension, especially considering fellow guards Sugar Rodgers, Epiphany Prince and Shavonte Zellous are all expected back with the team. Allen entered the All-Star break averaging 2.4 points, 1.8 rebounds and 1.9 assists across 14.8 minutes per game. After being waived prior to the season, Allen was brought back to New York at the end of May and has served in a minor bench role since. Her average of 14.8 minutes per game largely keeps her off the fantasy radar and the Liberty are just a game out of first place in the Eastern Conference standings, so their regular rotation is unlikely to change. She'll need to earn a more prominent role before being an attractive fantasy option. The Liberty announced Tuesday that Allen will be rejoining the team, summitthoops.com reports. Allen was drafted by the Liberty in the second round of the 2017 WNBA Draft, but was ultimately let go prior to the season kicking off. However, with Brittany Boyd now out for the season with a torn Achilles, the team has opted to replace her on the roster with Allen. The rookie set records for assists in a season and in a career at Notre Dame, but averaged just three points and two assists over three preseason games in with New York.